The leader of Team O is very consciously using civil rights principles to make the Republicans (more) insane, and the "filibuster watch" is on. The sooner they openly shut down legislation, the better, the sooner their Party's spine will be broken. That spine must be broken because, in short, it is a corporatist spine. The man's realism comes through below, and then Hertzberg, an actual journalist, sketches the reasons why maintaining a bipartisan posture makes sense. 1) (Obama Interview) "But he did say that he thought the GOP party-line vote was a fait accompli long before it was taken. "Look," he said, "once a decision was made by the Republican leadership to have a party-line vote -- a decision that I think occurred before I met with them -- then I'm not sure that there was a whole host of things that we were going to do that was going to make a difference." 2) (Hertzberg, New Yorker) "Fifty years ago, the civil-rights movement understood that nonviolence can be an effective weapon even if—or especially if—the other side refuses to follow suit. Obama has a similarly tough-minded understanding of the political uses of bipartisanship, which, even if it fails as a tactic for compromise, can succeed as a tonal strategy: once the other side makes itself appear intransigently, destructively partisan, the game is half won. Obama is learning to throw the ball harder. But it’s not Rovian hardball he’s playing. 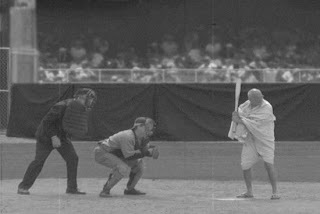 More like Gandhian hardball." The holes in this boat may be too big to fix, but this guy can be a joy to watch. The holes are too big to fix, but there is hope. I think the key lies in Shakespeare. I just saw Hamlet 2 last night. In it Jesus travels in a time machine with Hamlet to keep Hamlet from destroying himself. The take is that we are Hamlet. Shakespeare understood this. He lived in a time when England was catholic, then protestant, then catholic, then protestant again. The punishment for being a member of the wrong church was death. Severed heads were regularly put on poles along London's Bridge. Shakespeare's father was probably a closet catholic. Shakespeare must have seen and kept quite about a number of things -- especially because he didn't want to be blacklisted. Add in a little gaiety, and he had both rich and poor rolling in the aisles. Shakespeare also named his son Hamlet. The point is that Shakespeare lived through a time as turbulent as the one we are facing today. Who or what will be our god when the money is gone. George Carlin says if there is a god, he would want us to have enough food and a place to live. I have already said too much. As for the GOP, they died today in California. I hear the angry mob will grow to 20,000. How you so smart bout Shakespeare, foo? And can I hear an amen on "angry mob?" Dunno what you talkinbout but it sounds real good. I think the angry mobs, if this economy gets any worse, might happen, in certain parts of the country. Probably not Virginia, we're too "southern genteel" here to do much mobbing around. I've been saying for awhile now, that Obama has a plan - I may not fully understand it at times, but I can see the pattern there. This guy doesn't fly by the seat of his pants, this much we know. I'm in a "wait and see what the show has to offer" mode, myself. I think Obama needs to start hurling some Chin Music at them. he has managed to keep his plan hidden, but he has deeply studied Lincoln and FDR and knows the country faces a challenge as big or bigger than those leaders did. You are back! Thank you for coming back, and my thanks to your mom for adding so much good in this world and bringing up kids who add even more.